So I am glad you are all loving my Give Away! 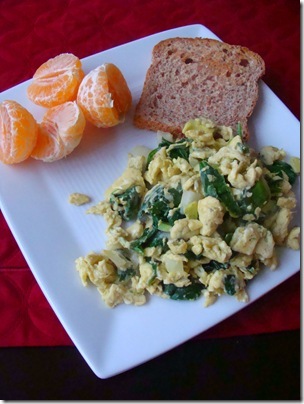 For breakfast I started off with a spinach scramble, spouted toast and two clementines. The scramble had 1 egg + 3 egg whites, a handful of spinach, white onion and avocado. I baked some tofu this morning and I added it to a vegetable stir fry that I created. 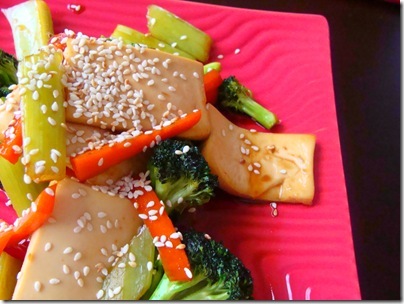 Carrots, celery, broccoli heated with sesame oil and teriyaki sauce. 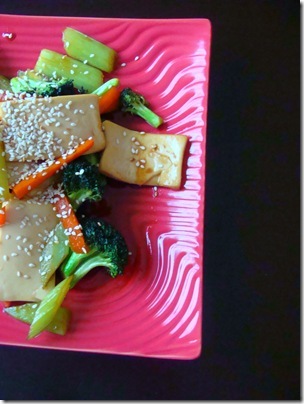 Then I added the tofu and sprinkled with sesame seeds. Delish! This entry was posted in breakfast, lunch. Bookmark the permalink. holy awesome plate!! 🙂 I love hot pink!! Breaky looks yum, I think I might have something like that this morning! LOVE the plate. I need to do avocado in eggs. I love, love, LOVE warm avocado!